Zarathustra retired to the mountains and after many years of meditation and absence from the human affairs and having long pondered about the questions of human mor(t)ality, he came back with an important announcement. 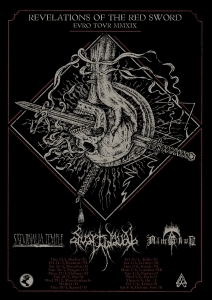 "You shall go to Urban Spree on May 23rd, as on that date the warm-up show of Wolf City Fest takes place, to hear the Revelations of the Red Sword, as imparted on us by Svartidauði. You shall also listen to the teachings of Almyrkvi, and lose your senses in the psychedelic chaos of Saturnalia Temple. You shall be reborn, and you shall drink the mead of wisdom and the ale of madness".